Viveat Susan Pinto reports on how market leader Horlicks hopes to beat the clutter and stay relevant for an increasingly health conscious consumer. Horlicks brought actor Taapsee Pannu on board in November 2017 to promote Women's Horlicks, the variant targeted at females. A month ago, health food drink Horlicks attempted something novel. It launched a digital campaign that spoke of exam pressure faced by youth sitting for competitive entrance tests. Titled 'Fearless Kota', the campaign put India's coaching capital in the spotlight, bringing to the fore an uncomfortable reality -- of students committing suicide due to exam pressure in Kota -- and the need for emotional support for them. While Horlicks, the country's largest health food drink, has traditionally addressed mothers and kids through the years and has even picked up the issue of exam phobia faced by children, this is the first time the brand has picked up on an extremely local problem to push out a global message. At the same time it appears to be addressing an older target group, namely, college-going youth taking competitive engineering and medical tests. Coming at a time when the nearly ₹75-billion domestic health food drink market is seeing competitive intensity, it is not surprising, say experts. Horlicks is addressing a wider set of people and emphasising its strong ties with the country with its communication. As rivals such as Mondelez with Bournvita, Kraft-Heinz with Complan, Nestle with Milo and Danone with Protinex Grow renew aggression in the marketplace with newer products and bigger and bolder campaigns, the pressure on the leader Horlicks, which is estimated to control over 50 per cent of the domestic health food drink market, is only growing. Recently, the company that manufactures and markets Horlicks, namely, GlaxoSmithKline (GSK) Consumer Healthcare launched a protein variant of the health food drink called Horlicks Protein+, targeted at adults, mostly, males. 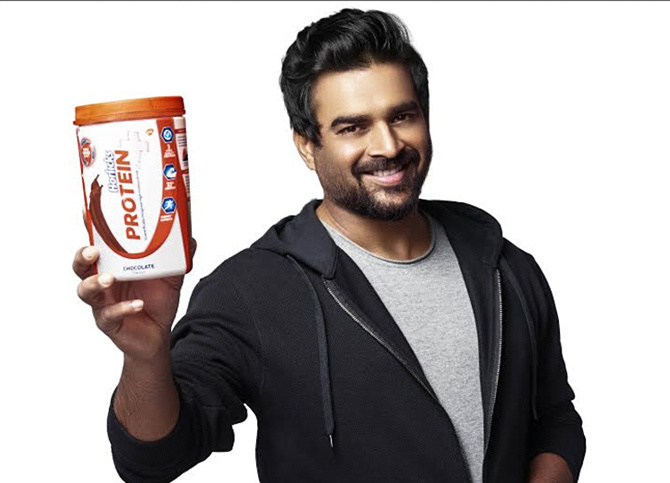 It also appointed a brand ambassador in actor R Madhavan to drive home the point of protein as a daily nutritional requirement. Vikram Bahl, area marketing lead, nutrition & digestive health, GSK Consumer Healthcare, India, said the launch (of Horlicks Protein+) tapped into a felt need for relevant products driven by consumer insight. "It delivers on the benefit of quality proteins to help Indians lead a healthier, more fulfilling lifestyle," he says. Madhavan's appointment incidentally preceded that of actor Taapsee Pannu's in November 2017, when she was brought on board to promote Women's Horlicks, the variant targeted at females. Horlicks recently launched a protein variant of the health food drink called Horlicks Protein+, targeted at adults, mostly, males. It also appointed a brand ambassador in actor R Madhavan to drive home the point. While Horlicks has been launching products beyond its core base of mothers and school-going kids over the last few years, this effort has been galvanised now. The current initiative comes, say experts, as people increasingly get health-conscious and demand more specialised products, a point endorsed by Bahl. In many respects, Horlicks, the largest brand of GSK Consumer Healthcare in India, estimated to contribute nearly 70-75 per cent to its topline in the country (FY2016-17 net sales of the company stood at ₹44.21 billion), is also filling gaps in its portfolio. While a drink for pre-schoolers, lactating mothers and women had been launched some years ago, a health food drink targeted mainly at males was clearly missing and so was the need to address issues plaguing the youth. Those loopholes have been plugged now, say experts, but is the battle over for Horlicks? Far from it, they say. As K V Sridhar, founder and chief creative officer, HyperCollective, says, the health food drink market throws up new challenges every few years. The reason being evolving lifestyles, bringing with it the risk of disease and the task of managing it. Though general health consciousness in the country has grown in the last few years, lifestyle-related diseases are also on the rise, implying health food drinks have newer goal posts every few years. To put things in perspective, India leads in deaths due to heart failure in the world, according to an International Congestive Heart Failure study conducted last year. Other issues such as obesity are on the rise, putting pressure on health food drinks to address all of this in some way. Horlicks seems to be acknowledging the need for such products with variants such as Growth+ (to aid growth in children) and Cardia+ (to boost heart health) respectively. But as health food drinks, say experts, increasingly begin to play on the platform of science and nutrition -- something that Nestle's Milo, Danone's Protinex Grow are also doing apart from GSK Consumer, the need to stand out will only grow. Horlicks then has quite a challenge of not only expanding the market, but also fighting rivals. Everyone wants health in a bottle!